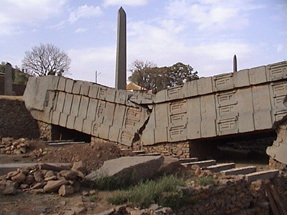 Axum is renowned for the world's tallest monoliths, or obelisks carved from single pieces of rock. Some experts believe they were erected to mark the passing of some ancient royal personages; others say that they had an astronomical function. Its greatest significance, however, is as the epicentre of the Queen of Sheba dynasty, upon which rests the notion of the sacred kingship of the Semitic peoples of Ethiopia- a notion that links the recent past to ancient times in a most unambiguous fashion. Set amid a smooth grassy plain, in contrast to the jagged peaks and maze of ravines, which virtually isolates it from the outside world, Axum has a history that goes back more than 2,000 (possibly 3,000) years. It was the centre of one of the first civilisations to adopt Christianity as a state religion. The extensive traces of noble buildings with large stone foundations are found here side by side with the ruins of even more impressive structures, temples, fortresses, and rich palaces. The relics of bygone eras protrude everywhere through the soil. Even today, ling-buried hordes of gold, silver and bronze coins are sometimes exposed by heavy downpours of rain. Axum's greatest significance, however, is as the epicentre of the Queen of Sheba dynasty, upon which rests the notion of the sacred kingship of the Semitic peoples of Ethiopia- a notion that links the recent past to ancient times in a most unambiguous fashion. Among all the different narratives, the Ethiopian Legend- where Sheba's name becomes Makeda- is the richest and them most convincing. It appears in the 'Glory of Kings' (the kebre Negest), the Ethiopian national saga written in the 14th century. The oldest church in Africa south of the Sahara is the first St Mary of Zion Church, originally built around the 4th century. Emperor Fasilidas replaced it with a newer church around 1635 which is still a place of active worship, notable for its crenellated, fortress-like walls. Its hushed interior, resplendent with many beautiful murals and paintings, evokes a mood of contemplation in an atmosphere of antiquity. The modern chapel next to St Mary of Zion church is said to contain the sacred Ark of the Covenant, but no one except the Orthodox pries who serves as the chapels custodian is allowed to enter the building. Still accessible today are underground vaults believed to be the tombs of the 5th century King Kaleb and his son, King GabreMeskel. Steep steps made of large blocks of neatly-carved stone, which fit together precisely without any mortar to hold them in place, lead down to a labyrinth of galleries containing what appears to be coffins. Coins minted in the reign of King Kaleb are among the thousands of Axumite gold, silver, and bronze coins unearthed since that period. Preceding Axum, the town of Yeha was the centre of the earliest known civilisation in northern Ethiopia. But all that remains of the city-state, established in the mists of time, are the towering, yellow limestone ruins of the Temple of the Moon, which dates back to the 5th century BC.